The first big juicy financial story of the year has everybody and their Mother's Facebook friends trying to figure out what the implications are in Goldman Sachs investment in Mark Zuckerberg's empire. Is this the first leg of the race toward the most highly-anticipated IPO in history? Another shady maneuver by the investment bank everybody loves to hate as of late? Or just a matter of a bank largely known for its shrewd investing strategy jumping at another sound financial opportunity? See how well you're informed on Goldman's investment by taking the quiz below. Bonne chance. 1. How much money, approximately, does Goldman Sachs stand to make from its Facebook investment? 2. How did Goldman Sachs arrive at its $50 billion valuation of Facebook? (a) invest in Facebook, a great company which offers excellent products and which serves as a model of how a start-up can not only serve mankind in a sustainable, socially responsible fashion, but can also make for a helluva movie about greed and bratty Harvard kids and how the rest of us follow them blindly into the abyss. (b) quit my job and travel the world. (c) quit my job and go back to B-school. 1. The SEC is so much dumber than the executives at Facebook and Goldman Sachs, which is why the GS investment will stand as is and Facebook will still be considered a private entity with fewer than 500 investors and still won't have to publicly report its financial results. 2. Lloyd Blankfein has a Facebook account with, as of January 4, 2011, 12:28 p.m. EST, 12,875 friends. 3. If you work at Facebook, you will automatically be added to Lloyd Blankfein's list of friends. 1. How does Facebook make money (please limit your response to 666 words or less)? 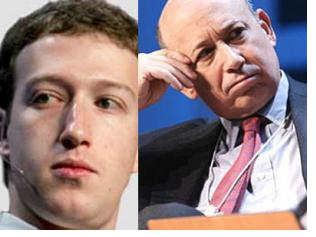 2. Who do you think has more friends (Facebook and real) and why: Mark Zuckerberg or Lloyd Blankfein? 3. If you were one of Goldman Sachs high-net-worth clients and one of your friends who didn't have several million dollars in the bank with which to invest in companies like Facebook (if you must, please pretend that you have friends who are not millionaires and thus do not qualify as "high-net-worth" clients and thus are unable to make these sort of investments only offered by private wealth managers at Wall Street banks) and this "friend" asked you if she could buy a Facebook share or two from you, would you sell the share or shares to her? Why or why not? And, if yes, at what price would you sell the share(s)?